I'm fairly new to climbing, I've been climbing just over a year. This is my first pair of shoes. I've worn the soles down, and wondering whether this kind of wear can be repaired or not, or if I should just buy new ones. I guess I tend to drag my foot along the wall a lot, but I wound up wearing down the rubber on the inside of my toes, and the rigid inner sole is exposed. They are a 90$ pair of Scarpa Origins. Been used for about 15 months. I climb about 6 hours of bouldering a week at my local climbing gym. I read this article, and give both some good pros and cons of resoling or not, but I don't have any experience yet to make an informed decision off of, being my first pair. One of my climbing buddies told me about resoleing when I showed him. Another guy I asked at the gym said "Nah, just buy a new pair, cuz chances are something else will go soon too." Just looking to see what everyone else has to say. Shoes can be resoled from a worse state. My current shoes have been resoled from a similiar state three times. The first time they worked even better than new (the rubber was better). Edit: here is a nice breakdown how it's done. These shoes are pretty far gone. At the very least you'll need a new toe rand in addition to the resole, which is going to cost you a significant portion of the price of a new shoe. Your shoes may even be too far gone for any repair at all. Treat this as an opportunity: it's unlikely your first pair of shoes fit exactly right. Now, you know much more about what you liked and disliked about your shoes. Take this chance to try on a lot of new models, and pick out a shoe that you like even more. Next time, get your shoes resoled before they show signs of wear on the rand. Here are some images showing the signs of needing a rand repair. 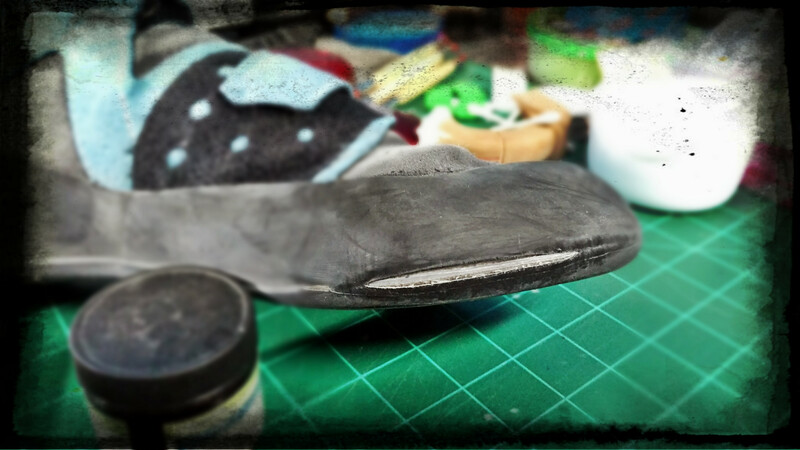 Resoling shoes is great, but rand repair is costly and lowers the lifetime of your shoes. I generally get 3-5 resoles out of my shoes before retiring them. Not the answer you're looking for? Browse other questions tagged rock-climbing bouldering repairs climbing-shoes or ask your own question. What's the best protection for my knees while bouldering?